The words come from the driver’s seat out of a pool of darkness blotted by distant blurred lights. One hand grasping a flip-top bottle of Powerade, the other on the wheel of his moderately pimped out blue VW Golf, driving into Alex to watch South Africa play Uruguay with two filmmakers as company, I get the impression that Patrick is doing just that––proving himself. Even without our camera following him around though, Patrick is already a kind of celebrity in Alex and its easy to see why. Not quite twenty one, he’s a good natured, good-looking kid from Alex on a soccer scholarship at the University of the Witwatersrand (Wits). And as a consequence of the team––BidVest––entering South Africa’s Professional Soccer League (PSL), Patrick has become a professional footballer and gets paid well for the privilege––well enough to cover the VW and a house for his grandmother. The path has always been clear to him. We’ve heard this a lot in conversations since arriving in Alex and seen the omnipresent street soccer evidence of it even more. Clearly it’s all panned out well for Patrick but as we walk into The Executive, a bar packed with yellow and green-clad supporters of Bafana Bafana, I wonder about the others. Alex is home to approximately 1.5 million people most of whom are desperately poor. According to Patrick, just five are currently playing some form of professional soccer. He is one of those five and people flock to him. Literally. At a bar without an available seat, he finds a seat in the middle, on laps. The passions and fervor are astounding as the match evolves. Vuvuzelas blaring. The crowd screaming. It’s deafening. 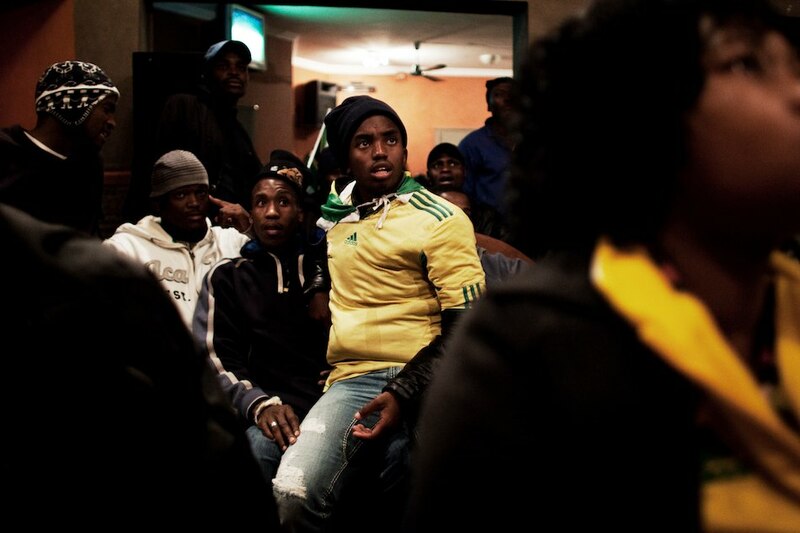 Just as the name of their team––Bafana Bafana––denotes, these are their boys. A collection of true come ups shining on televisions all over the world from glittering new stadiums on a continent that has never before hosted the world’s biggest sporting event. he match, though, is a terrible disappointment. South Africa loses 0-3 to Uruguay making it nearly impossible for them to advance into the round of sixteen. It will be the first time a host nation fails to advance. No matter though. Flipping a switch on the mixer, the DJ swaps the amplified audio from the game for dance tunes. The bodies packing the bar don’t miss a beat either. They dance. Patrick and his PSL team have a probable friendly tomorrow with the Portugal national team though and he’s a professional so we leave. He may be a professional footballer but as he says there’s another rung or two yet to climb. Sadly, the odds aren’t good for Patrick or for Bafana Bafana who won’t get the free host pass into the 2014 World Cup. I’m sure as hell routing for them though. After all, Patrick, Babes, Ricardo, Shakes, even Nancy; they’re all my boys now too. This entry was posted on Wednesday, July 14th, 2010 at 10:51 pm. It is filed under Characters, Raiden and tagged with patrick phungwayo. You can follow any responses to this entry through the RSS 2.0 feed.